Questa guesthouse a gestione familiare è stata una bella scoperta. Prezzi abbordabilissimi, stanze pulitissime. Il proprietario è molto gentile. La guesthouse dispone inoltre di parcheggio proprio e si trova in posizione strategica per visitare i monasteri di meteora. Possibilità di fare colazione (al prezzo di 6 euro abbiamo mangiato: yogurt greco, arancia, torta, omelette, toast con formaggio e prosciutto, pane tostato con burro e marmellata, caffè e succo d’arancia). Consigliatissimo. Lindas vistas y buena cama! Todo lo que necesitabamos encontramos en este hotel. Una buena cama y una magnifica tranquilidad con fantasticas vistas hacia el pueblo y hacia la montaña. El persona muy amable y el desayuno muy completo. Pasamos apenas una noche. Muy recomendado.. I spent a couple of nights in June at this cosy family-run establishment in Kastaraki. I was given a large room with an amazing view of Meteora's extraordinary rock formations. I could have just sat on the balcony of my room for a whole day! The family all speak some English & provide a good breakfast. The rooms are reasonably priced. I think I paid about 25 euros for a single (but they gave me a double for that price). I was very happy here! I took the bus from Kalambaka to Kastaraki & then walked to the hotel (you can also take a cab for a few euros from Kalambaka). Next day, I caught the public bus--right in front of the hotel--which takes you to the topmost monastery. I then walked to the others without too much trouble (but it was hot in June and I had to leave out a couple because they were too far away to cover on foot). I would recommend staying in Kastaraki instead of drab Kalambaka which has no charm & has been eaten away by tourism. Besides, you'll be right at the base of the rocks which explains the stupendous views. The town is small & has a rustic flavor while providing all the amenities you need. Just take the bus back to Kalambaka when it's time to leave Meteora. It only takes 15-20 min. to get there from Kastaraki. Amazing views from rooms, welcoming hosts. Excellent location for visiting Meteora which was spectacular. Breakfast for €5 per person was large and really good value for money. If I could go anywhere tomorrow I'd choose here.. 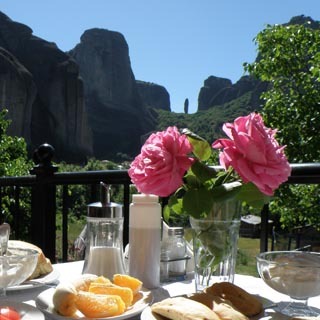 The hotel is comfortable and very well located for Meteora hikes. It is run by a lovely and very helpful couple. - The views are quite something. Especially on Meteora/Kastraki side of the building. - Wifi works great! - The walking route to Grand Meteora starts not far from the hotel. - On the whole, we found Kastraki as a more pleasant, more scenic and gentler option to Kalambaka. There are plenty of fantastic restaurants towards the church - only 5-10 mins walk from the hotel. My 3 night stay at the start of December was wonderful. The hosts are lovely people, and their hotel is very nice. The room is ok and so are the beds. The balcony offers stunning views. The bathroom is more than big enough. Breakfast was great and very filling. I was served eggs, bread, toasted ham and cheese sandwich, Greek yoghurt, glass of milk and biscuits. More than enough! It was very nice to be able to relax by the roaring open fire in the evenings. I decided to walk to the hotel for the Train station, about a 20 to 30 minute walk. You can also walk to Kalabaka which is 20 to 25 minute walk each way. It is very quiet and peaceful place to stay. Yes i would stay here again.